Mr. Case Barnett is GREAT! The people are very nice, friendly, sweet and very professional...From the bottom of my heart, Thank you so much for everything.Marilou B. 1. Clients always know what is going on in their case. 2. We recover the maximum compensation for your claim. 3. Legal issues are handled in an organized and timely manner. 4. Our client's can focus on healing while we handle everything else. 5. Your medical bills are being managed so that they don't take over your life. 6. We protect you from the dishonest insurance adjusters who are only out to ruin your claim. We have also developed a proprietary case management software to track every single detail of your legal matter. This exclusive software, along with the HitList™, guarantees that claims don't drag on for years; something all too common in personal injury law firms. We know that you are extremely busy. For this reason, we have made customer service the number one priority at our firm. It is amazing how much easier the process becomes when a skilled law firm can step in and handle all of the details, both big and small. 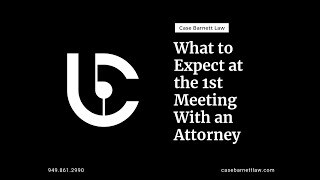 At Case Barnett Law everything moves as fast as possible without missing any details and you always know what is going on in your legal matter. Between working and taking care of your family there are never enough hours in the day. Our pledge to you is that we will never waste your time. Systems and procedures rule all that we do. This has created an efficient and organized workflow, something that is extremely important when navigating a complex personal injury matter. We work on contingency fee only. That means that if we don't win, you pay us nothing. The best way to start is simply to call us. The conversation is completely confidential and you are under no obligation to do anything more than gather information that will empower you. Call us at (949) 861-2990 to discuss your case. It's free, confidential and comes with no strings attached. We can help you by learning your story. We treat you with dignity and respect. We bring our reputation, compassion, and trial skills to successfully represent you. 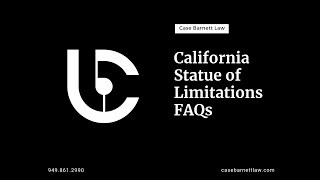 If you or someone you care about has been injured or killed in Orange County, please call Case Barnett Law today so we can tell your story. The last thing you should worry about is being denied fair compensation for your losses. Each minute counts. Don’t give negligent parties an advantage while you deal with your injuries. If you have been injured, contact us here to speak to an experienced legal professional at our Costa Mesa office today so that we can begin preparing a case on your behalf immediately. We are passionate about the work we’re doing on behalf of our clients. When you hire us, you are hiring a knowledgeable, distinguished, and tenacious team dedicated to helping you receive the justice you deserve. Not Ready to Speak to an Attorney Yet? Download our FREE BOOKS Today. Case Barnett is the author of several books and legal guides. We provide these for free to help injured victims like you. It's Settled: The Accident Victim's Guide to Settling Your Case Without Hiring an Attorney. The 7 Biggest Mistakes That Can Ruin Your Accident Claim. If you have been injured in a minor car accident in California you may not even need an attorney. This book may help you settle your own case and save you thousands of dollars. Learn what steps to take BEFORE an accident in order to protect yourself AFTER an accident. 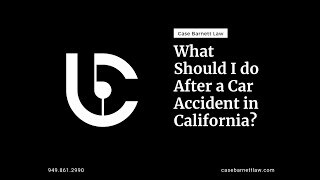 If you have been injured in a car accident in California this book will help you avoid mistakes that could ruin your entire claim. When you are searching for a nursing home or skilled nursing facility, use our Nursing Home Checklist to compare facilities and ask all of the right questions. If you have been in an accident in California, avoid these ten mistakes people make when dealing with doctors after an injury. 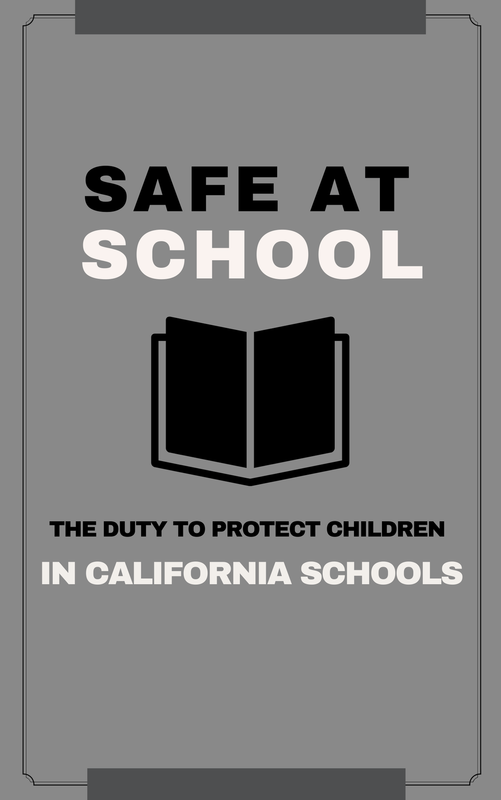 Learn what steps to take when you are filing a lawsuit against a public school district or private school in California. 1. 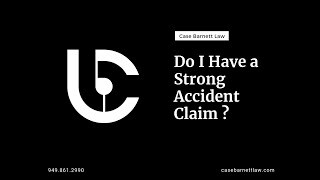 What are the first steps I should take after an accident? When you are involved in a car collision, it is important to have your car examined for defects as soon as possible. Typically, the car repair costs will be covered by either your own insurance company or the other parties’ insurance company. This will be dictated by what kind of insurance you have and what your deductible is. 2. 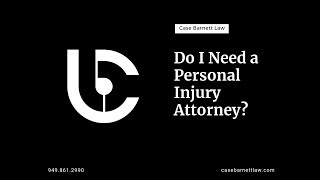 Why is it important to hire an attorney who specializes in personal injury? Only a personal injury attorney will know how to protect you from insurance adjusters and the negligent driver's attorneys. Accident cases can be extremely complex. 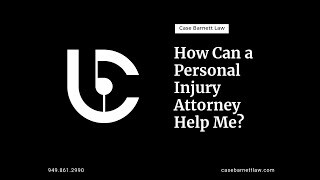 An attorney who specializes in personal injury will have a deep understanding of: damages (both economic and non-economic), discovery and all of the deadlines that accompany this phase of litigation, how to craft a powerful demand letter, negotiating settlement, coordinating with expert witness to testify in trial, undergoing mediation or trial and taking and defending depositions. 3. 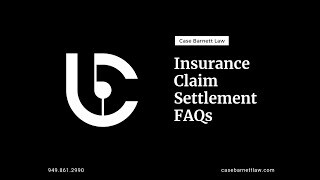 How do personal injury attorneys charge/what are their fees? How much does it cost to get a lawyer? Most personal injury attorneys work on contingency. This means that you pay nothing unless your attorney settles your case or a jury awards a verdict in trial. Some law firms make their clients pay for costs associated with their legal matter. Additionally, some attorneys make their clients pay for the costs if the case is lost. At Case Barnett Law, we pay all costs. If we don’t win, we still pay all costs associated with your legal matter. Many personal injury law firms charge a 45% fee of the total settlement. 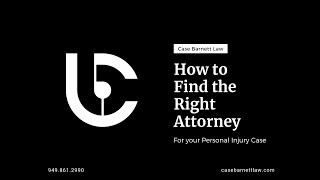 At Case Barnett Law our typical percentage on a personal injury case is anywhere from 33 1/3% to 40%. 4. Should I talk to the insurance adjuster? Do I have to talk to the insurance company? 5. How will I pay my medical bills? If you were injured in a car accident, the first thing you should do is seek immediate medical care. Medical treatment for any injury can be expensive—leaving you with a stack of mounting medical bills to deal with. Unfortunately, the insurance company for the negligent driver will most likely not pay your ongoing medical bills. They may take months investigating and disputing your claim before you see any monetary settlement. Here, we discuss how to handle paying your medical bills while you are attempting to settle your claim. Learn more. Hiring an attorney with trial experience is vital for all criminal and civil cases. No one likes to lose, especially insurance companies and prosecutors. The jury trial is the hammer that the U.S. Constitution gives to every individual. It is the great equalizer. It can set you free or it can bring a better resolution to your case. No one wields that hammer better than the attorneys at Case Barnett Law. Call 949.861.2990 today and let our attorneys help you.